$300 minimum PLANT order (before shipping). 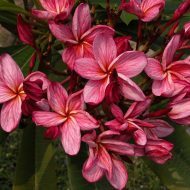 Currently we only ship PLUMERIA/FRANGIPANI internationally. At present, we do not ship to Mexico. 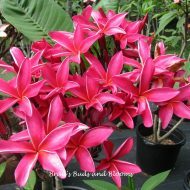 Plumeria seeds are exempt from special restrictions in most countries, but this is not guaranteed, so please make sure this is the case for yours. There is no minimum order amount for seeds. For PLANT orders, you must provide us with a current and valid Import Permit from your country. Seed orders do not require a permit. You must be able to tell us any special requirements your country may have concerning the importation of plants.Example: Australia requires all plants be sent under the name of the purchaser to the closest Quarantine Station, where they are planted and observed for a period of a few months until they can be released to the buyer. They may NOT be sent directly to the buyers home address. Does your country require a Phyto-Sanitary Certificate from the United States be included in the shipment? What special arrangements must be made? 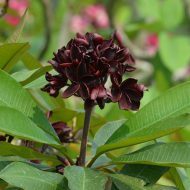 As we cannot know the requirements of every country, and, the fact that many rules change each year, the buyers should take responsibility to find out what is required in order to receive plants in his/her country. Phyto-Sanitary Certificate and any other special arrangements are paid by the buyer. Phyto-Sanitary Certificate must be purchased before plants may be released to you. International orders will be sent Global Express Mail/EMS or Priority Mail International with tracking number. It is advised that you purchase the optional postal insurance. Please understand that we cannot be responsible for losses and damages to your plant or seed orders due to any possible negligence or mishaps caused by the Postal services or the importing authorities and plant inspectors of your country. We package very carefully and thoughtfully to ensure the best conditions for your plants and seeds while in transit. However, please understand that we cannot assume any responsibility for plants or seeds once they leave the USA. Please inquire with us on purchasing postal insurance if you would like to insure your order against loss or damage. We have found that the best way, especially for longer in transit times for plant shipments, that using an all natural, organic anti-transpirant solution is most effective. 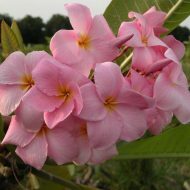 This seals in the plants moisture and the plumeria needs no water and can be wrapped in dry newspaper for up to two weeks, with no ill effects. Also, for countries that fumigate their plants upon arrival, this treatment has proven most effective in protecting the plants from the terrible effects of Methyl Bromide, which is widely used in countries like Australia. One recent shipment to Australia was about two weeks due to blunders by the carrier, and, the plants were treated with methyl bromide upon arrival to Customs in Cairns. The plants made it through Quarantine a few months later with no unusual or noteworthy losses and the customer was very happy with the results. Treatments as such is provided free of charge to international customers. However, if you want the roots wrapped in moist paper and then in plastic as many shippers still do, that is okay, but, please specify your wishes in this matter when you order. Please allow 10 days to process your order as various requirements such as phyto-sanitary certificate can require setting an appointment at the convenience of the USDA Inspection team in Orlando, which is also approximately 40 miles from our location. They are not always able to see us right away and it may be a few days before we can get them to inspect your plants. Also, your plants must be selected, then cleaned, treated, and packaged for shipping. Please be patient as we like to do things right the first time to avoid problems later on. We thank our international customers and look forward to meeting and serving you!